bl.uk > Online Gallery Home	> Online exhibitions	> Asia, Pacific and Africa Collections	> Panjab: Battle of Ferozeshah. Plate 7 from "Recollections of India. Part 1. British India and the Punjab" by James Duffield Harding (1797-1863) after Charles Stewart Hardinge (1822-1894), the eldest son of the first Viscount Hardinge, the Governor General. This depicts one of the three great battlefields of the First Sikh War, Ferozeshah which lies eleven miles east of Ferozepore, about nineteen miles from the left bank of the Sutlej river. 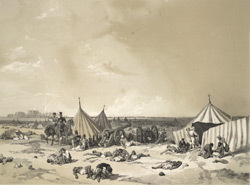 On 21st December 1845 British forces under Sir Hugh Gough and Sir Henry Hardinge attacked a formidably entrenched Sikh encampment. After two days of severe fighting the position was carried and the enemy routed, but the British lost 2,415 men. No trace of the old entrenchments remain, but a plain obelisk marks those who fell in one of the bloodiest engagements of the war.